It”s rare for the nation”s top-ranked prep football team to be unsettled at the quarterback position after two games. But sophomore Tate Martell and senior Danny Hong are still competing for the top spot at Bishop Gorman. It’s rare for the nation’s top-ranked prep football team to be unsettled at the quarterback position after two games. For Bishop Gorman coach Tony Sanchez, it’s all part of his plan. “Every year, we’ve had kids competing,” said Sanchez, now in his sixth season. In Friday’s 48-27 victory over Servite (Calif.), sophomore Tate Martell relieved senior Danny Hong late in the first half and sparked the Gaels, who had only 44 yards of offense until then. But according to Sanchez, Martell was going to see action in the first half no matter what. Martell, a 5-foot-10-inch, 185-pound transfer from Poway (Calif.), finished 7-for-12 for 120 yards and three touchdowns, and he rushed for 114 yards. The Gaels, ranked No. 1 in the country by USA Today, outgained Servite 353-238 in the second half with Martell at the controls. Martell made a nonbinding oral commitment to Washington as an eighth-grader. Two of his TD passes went to talented classmate Tyjon Lindsey, who also transferred from Poway. Martell’s parents are Lindsey’s guardians. The 6-3 Hong was 4-for-9 for 32 yards and an interception against Servite. He went 8-for-12 for 158 yards, one TD and one interception in the season-opening 44-0 win over Brophy Prep (Ariz.). Sanchez said he often had heated quarterback competitions at his former job in Northern California. Two years ago, he had to manage playing time between Jarrett Solomon, then a senior, and Randall Cunningham II, a junior. 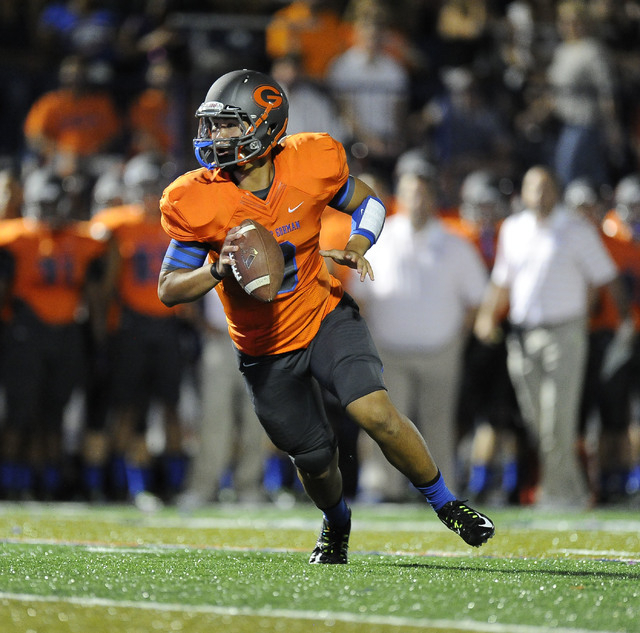 Sanchez did not say who will start Friday when the Gaels host Bingham (Utah), which is No. 18 in USA Today’s poll. He may have given a hint, though. Sanchez said senior tight end Alize Jones is expected to play Friday. Jones, a UCLA commit, suffered a bruised knee against Servite and sat out the second half. ■ SESSIONS HONORED — Centennial’s Roy Sessions was named Nevada girls coach of the year last month by the U.S. Track & Field and Cross Country Coaches Association. Under Sessions’ guidance, the Bulldogs became the first girls team to win four consecutive championships in the large-school division at the Division I state meet in May. Dayton’s Mike Paul was the recipient of the boys award. ■ RECENT COMMITMENTS — Arbor View senior Malik Noshi to Northern Arizona for football. … Arbor View senior Sam Pastrone to UNLV for baseball. … Las Vegas senior Devon Colley to New Orleans for men’s basketball. … Faith Lutheran senior Julia Becker to Sacramento State for women’s golf. … Green Valley senior Rachael King to Portland State for women’s soccer.